B Bar B Leather's patented design Bull riding glove is the hottest new bull riding glove in today's ultra competitive sport of bull riding. Our new deerskin bull riding glove has a patented design that pre-curves the fingers to allow a better grip, and longer wear. If you compare our bull riding gloves cost per ride with other bull riding gloves , you will find that our bull riding glove is a much better value. 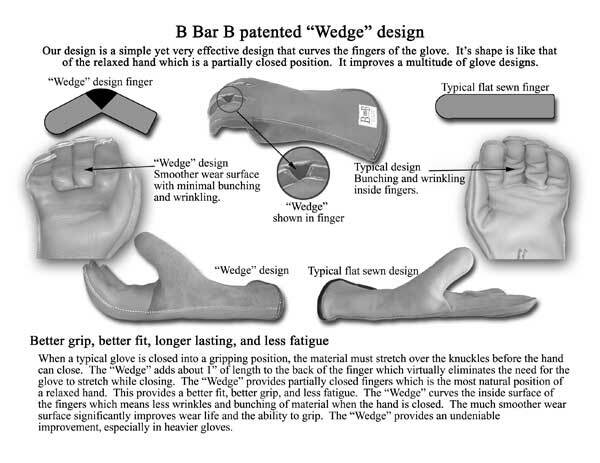 Our patented design allows an excellent feeling glove while using a slightly thicker deerskin. The patented design also provides a smoother wear surface which also adds to the life of the glove. The combination of comfort, excellent grip, and wear life makes our bull riding glove the premier glove on the market today.